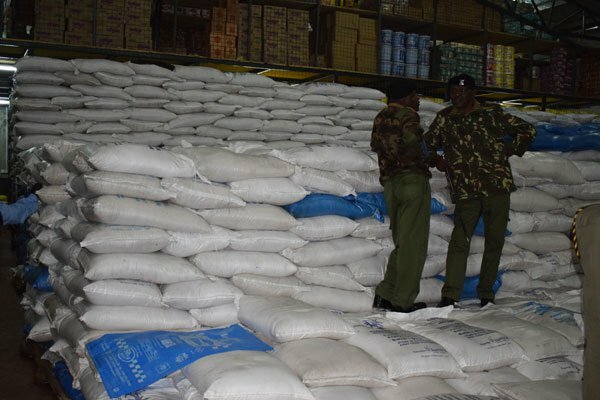 Police have seized over 12 tonnes of suspected contraband sugar in Eldoret being offloaded in a leading supermarket. The officers accompanied by Kenya Revenue Authority (KRA) officials intercepted a truck laden with cargo packed in 50kg bags while being offloaded to the warehouse of the supermarket. “We were alerted by members of the public about the arrival of suspicious consignment of imported sugar at the warehouse owned by the stated chain store. I instantly mobilized my officers and impounded the cargo before it could find its way into local market,” said Eldoret West OCPD Samuel Mutunga who led the joint operation. The incidence joins the bandwagon of other incidences of the poisonous contraband sugar that has been intercepted in various parts of the country including Kitui, Meru, Bungoma, Nairobi and now Eldoret. Interior Cabinet Secretary Fred Matiang’i has been quoted saying that he is ready to die in the fight against cartels importing substandard goods in the Kenyan market.